In total, tennis courts measure 78 ft. x 36 ft. or 2,808 sq. ft., however the full area of the court is only used for doubles matches. The singles court measures 78 ft. x 27 ft. or 2,106 sq. ft. Every court is composed of quite a few elements, so let’s take a look at each individual component. Helpful tip: keep a retractable measuring tape in your tennis bag and measure the height of the net prior to playing. There are enough variables in tennis already, so I always urge my players to make sure they control the factors that they can whenever they step on the court. On most courts net posts will fall 3 feet outside of the doubles sideline directly at the middle of the court. Some courts have the ability to install a singles net, and on these courts the net posts would fall 3 feet outside of the singles side lines. The posts shouldn’t be any more than 6 inches wide. If you’re playing singles on a court with a doubles net installed then two sticks should be used to prop the net up 3 feet outside of each singles sideline. In many cases courts won’t have singles stick and many competitive matches in high school and college are played without them. However, whenever you watch professional tennis you’ll notice the sticks are always installed for singles matches. Well, there you have it! You should now be a master of the dimensions and layout of a tennis court. Make sure you share with friends and teammates and heck, now you have some cool little tidbits of knowledge for your next cocktail party. Have questions about tennis courts? Let me know in the comments below – I’d be happy to help out. For international competition it’s recommended that the space or distance between the baseline and the backstop should be 21 feet. The distance between the sidelines and the sidestops is recommended to be 12 feet. If you’re measuring from the net post this distance should be 9 feet because the distance from the sideline to the net post should be 3 feet. The recommended measurements for recreational play are slightly shorter. 18 feet between the baseline and the backstop and 10 feet from the sideline and sidestops or 7 feet from the net post. Hopefully this helps :) Please let me know if you have any other questions. PS – here’s a quick bonus. If the court is indoors the minimum recommended height of the ceiling should be 30 feet. Sir great guidance this sure will help a lot of people……. Thank you for the useful info on your site. Can you tell me what the stndard length of a net should be. If the posts are 3 feet outside of the doubles court lines how much is allowed for the static hook and winder spindle on either side. Great question! Nets made for singles and doubles play are 42 feet in length. 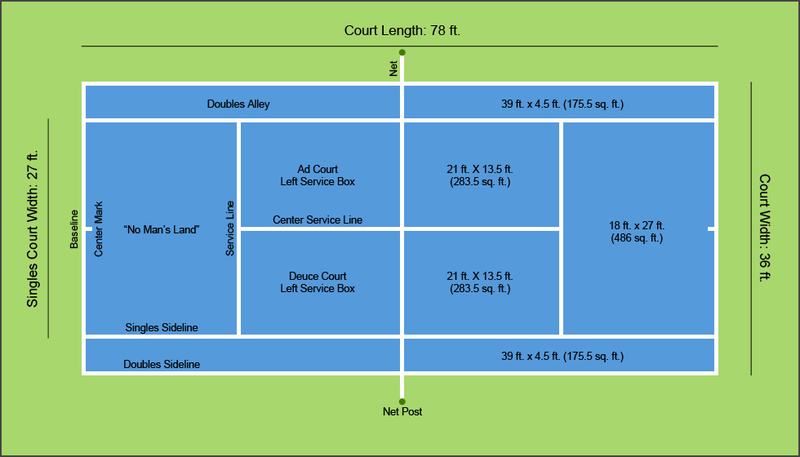 The width of a court including doubles alleys is 36 feet and the net posts are required to be placed 3 feet outside the doubles sideline. If we take the quick total (36+3+3) that gives us our 42 feet, which the net needs to cover. Recognizing this the net should extend right to the edge of each net post. The cable that passes through the band at the top of the net will be a few feet longer than 42 feet so that there is ample cable to wind the net so that it’s taut – this extra length can vary slightly from manufacturer. Hi Zanna! Me too ;) Thanks for stopping by and for the positive feedback. Are outdoor courts supposed to face a certain direction, to avoid sun or wind direction? I love this question! It’s not super straightforward, but let’s dive into some of the details. The direction of the sun changes throughout the day and year. It also varies for locations further south or north of the equator. The key is to consider these three factors and then determine the best direction to optimize play by keeping the sun out of players eyes. As for wind, I wouldn’t worry about it :) It’s best to focus on the direction of the sun first and foremost. Hopefully, this helps point you in the right direction. Feel free to share more details, and we can figure it out together. Great resource. I was looking for tips on how to set up the singles sticks to ensure the net is 6″ higher at its edges than in the middle. Is there an official way? How do you do it? Thanks for the note! Yes, there’s definitely an official way to make use of singles sticks. First off, you’ll want to make sure your net is well tensioned. Then check to make sure the height at the middle of the net is 3 feet and adjust the strap if necessary. Once you’ve done that, you can place the singles sticks on either side of the net 3 feet from the singles sideline, and that’s it. For reference, singles sticks are the same height as the net posts or 3.5 feet tall, and if you notice, the net posts are placed exactly 3 feet outside of the doubles sidelines, which I find is a good point of reference to help remember. Hopefully, that helps, let me know if I can help clarify anything.